Congratulations to Mr. Shane Gordon. Mr. Gordon was awarded an Excellence in Education Award by the ROE. He has been an innovative leader at A-Town High School the last five years. 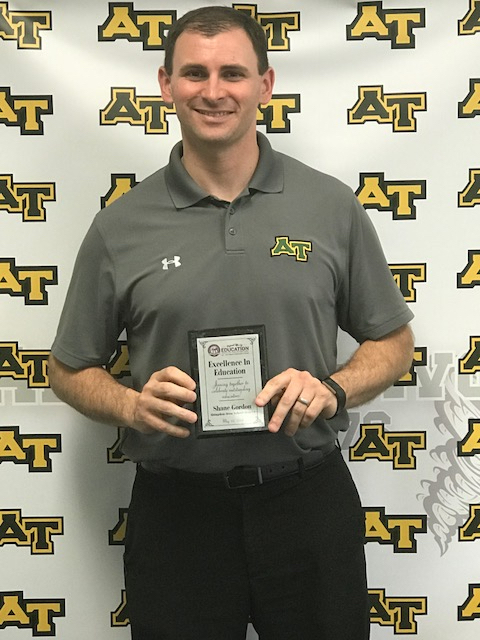 He has guided a 1:1 technology program, advocated for 21st Century classrooms, adopted the trimester system, and implemented numerous other innovations during his time at AAHS. Mr. Gordon is an Abingdon High School graduate and Monmouth College alumni who returned home to serve the students and community he grew up in. Also, congratulations to Mr. Gordon on his new position. He will be leaving our district in order to take the next step in school administration. Mr. Gordon become a superintendent in 2018-2019. His new district is gaining a thoughtful and innovative leader. We thank him for his dedication to AA276 over the past 5 years and wish him well as he starts his next career adventure.